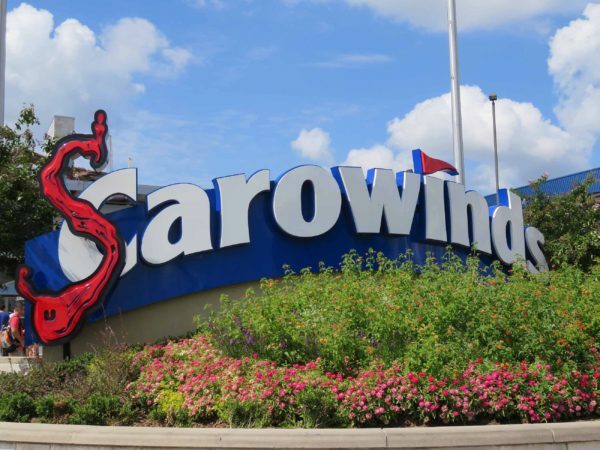 If there’s one thing we’ve learned over the past few years writing about Carowinds, its that SCarowinds is constantly evolving. Having visited the last three seasons — if you need a refresher, check out our reviews from 2015 | 2016 | 2017 — there’s always something new to see and be scared by at SCarowinds. Now in its 19th season, the 2018 version of the park’s Halloween Haunt event is keeping this trend of “something new every year” going. While last year’s six mazes — Dark Harvest, Depths of Darkness, Silver Scream Studios, Slaughter House: The Final Cut, Urgent Scare, and Zombie High — will all return (one with a new theme – more on that later!) in 2018, SCarowinds will be adding two new scarezones: Dead Man’s Landing and The Hollow, replacing former scare zones The Playground and Scary Tales. If you’re familiar with the history of the Carolinas, you already know that Edward Teach, better known as the pirate Blackbeard, terrorized the citizens of both North and South Carolina. Personally, I love the idea of this new scarezone, because it ties into Carolinas-specific tradition and lore, which has been a focus of Carowinds in recent years. Though a location hasn’t been announced, I’d imagine that Dead Man’s Landing would occupy the space that housed Scary Tales last year. The midway of the Carolina Boardwalk area near Chickie & Pete’s, with its nautical theming, seems like a natural fit for this new scare zone. I hope the skeleton key involves a search for buried treasure. As you walk into The Hollow, you quickly realize something is very, very wrong. The fruits and vegetables of a once-vibrant garden of colonial days have shriveled and given way to a wretched, forsaken boneyard. Plump, orange orbs (Were they once pumpkins? It’s hard to tell.) have morphed into evil creatures who carve their victims into unimaginable, unidentifiable shapes and forms. Will you be next? With “The Playground” going away, it frees up a scare zone location in Crossroads, near Plants vs. Zombies, and more specifically, Carowinds’ corn maze, Dark Harvest. Again, the locations for the new mazes haven’t been confirmed, but I feel like The Hollow could serve as an “extension” of the Dark Harvest story line, and would make sense with the area – there’s much less of a disconnect between a garden setting and a cornfield than there is a playground and a cornfield. Also, “pumpkins with knives” sounds terrifying. Looking through the SCarowinds website, it looks like there may be a few other minor changes to the mazes and scarezones as well. Silver Scream Studios looks like it has a new backstory as well this year at Carowinds, with the new name of Silver Scream Studios: Condemned. Once we got inside the dank and dark walls smelled of death, and the sounds in the distance seamed to move with us. I’m not sure if we are alone, or if Von Hellsburg’s evil spirit still lives in these walls. It’s as if the evil is breathing a horrible new life into the terrifying scenes of death. After three years, it appears Heinrich Von Hellsburg has finally given up on trying to cast “the most realistic horror film ever made,” and this year’s version of Silver Scream Studios will take place in the time frame following his casting (and maybe after the movie was created?). I’m curious, but also excited at how the story will change. Silver Scream has never been my favorite maze, but maybe a new story can breathe some new life into it. What do you think of SCarowinds new scarezones and the other changes? Let us know in the comments below! **i dont think there will be skeleton keys this year..